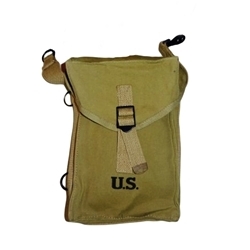 U.S. M1 Ammunition Carrying Bag. This 1943 model is a general purpose ammo bag made from O.D. canvas and was used for carrying all sorts of ammo. From boxed ammo for machine guns, rifle clips, carbine magazines and mostly hand and rifle grenades during WWII. This version of the M1 ammo bag DOES NOT include a carrying strap. Our WWII M1 Ammo Bag will appeal to WWII collectors and re-enactors.